PHP allows you to create custom forms like contact form , registration form, login form. 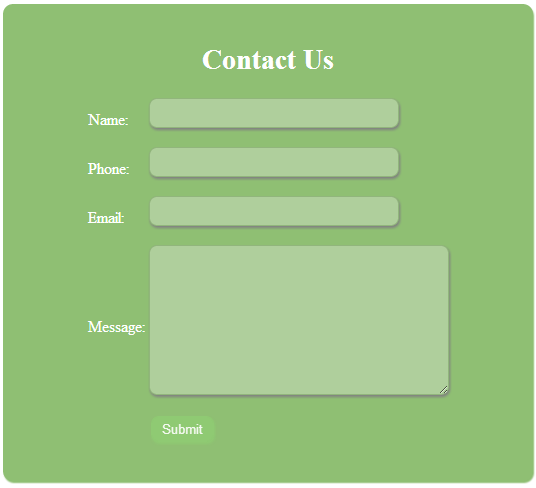 A websites should contains contact form for user contact them. You can create contact form and send user details to website owner using PHP mail. Let see create contact form using PHP. You need to create front end design for user view. This is the static page which is developed using HTML. It should be below HTML code. When you run above HTML file, it should not be attracted by user. So you need to add some CSS to that HTML file in order to make your contact form as attractive. Some of CSS styles are below. After designed HTML form, you need to get user details and send it to website owner using PHP mail(). Visit How to send mail using PHP. Let see below PHP script for send mail. Combine above all script and make one PHP file with .php extension. This is the contact form of your website. It should be like below. Now you can add this contact form to your website and make conversion with your clients. Already you know about validate login form with remember me and signout concepts using php. 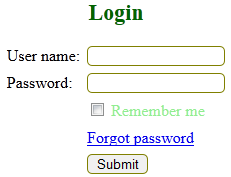 You want to know Login with remember me and signout using php and mysql. mysql_query("select * from login where mail='".$mail."' "); is select the values from mysql table. mysql_affected_rows() return the number of rows selected. If it returns 0, then there is no values is present in mysql table. mysql_fetch_array() return the results an associated array. You want to know mysql_fetch_array(). Mail() is used to send password to mail. Yow want to know mail() in php. You entered your email id in text box and click submit button. Now you can get message 'Check your inbox in mail' if the mail is send. Otherwise, you'll get 'Mail is not send' message. If you enetered mail id which is not present is mysql table, then you will get 'You entered mail is is not present' message. You can send emails using php. to - receiver mail id. subject - subject of mail. message - message to be sent. header - header of mail. You can send mail if you are in server. You've to make some changes in php.ini file, if you send mail from local server. You've to make following changes in your php.ini file to send mail. If the the mail is send, then you'll get successful message. Otherwise you'll get 'Mail is not send' message. Now you can see mail in inbox.